I believe that this is the first soup that I’ve made this fall, and it is a good one. I used canned beans so it came together really quickly. Even though soup always tastes better the next day, this was pretty fabulous. It is hearty and full of comfort. Due to the potatoes, it won’t freeze well, but I found that even after making a double batch we didn’t have any leftover to freeze. I served it with some rolls, but it also would be great with some crusty bread and a drizzle of olive oil. In a large pot, heat the olive oil over medium-high heat. Add onions and a little salt & pepper. Cook until soft, but not brown. Add garlic and cook stirring until fragrant, about 1 minute. Add navy beans, potatoes, chicken stock, bay leaf, and dill. Bring to a boil, then reduce to a simmer. Simmer until the potatoes are fully cooked and start to fall apart. Remove bay leaf and discard. Using a potato masher, lightly mash up the potatoes and beans. You don’t want to completely smash everything. 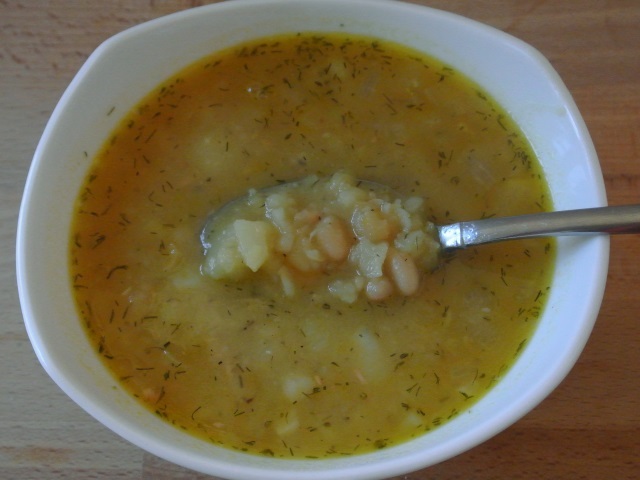 This entry was posted in soup and tagged beans, Dill, Potatoes.